The AFL Live app on the Pebble smart watch. 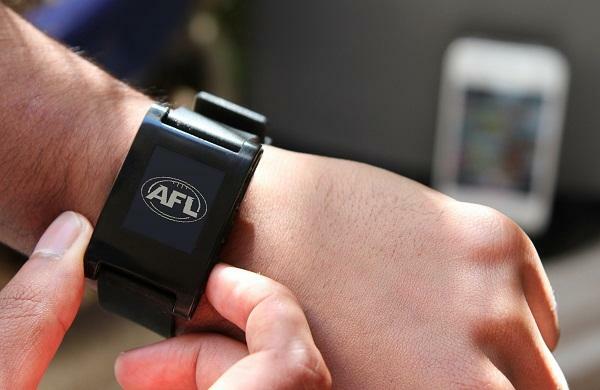 Australian Football League (AFL) fans who own a Pebble smart watch will be able to receive updates about the game on their watch from 12 May 2014. Telstra has developed a version of its AFL Live app for the smart watch which, once downloaded from the Pebble app store, lets AFL fans receive real time scores and updates to their smart watch. Information includes the two teams playing, who is in the lead and where the AFL match is being played. The telco has partnered with app developer Outware Mobile. According to Telstra director of digital media and content Adam Good, it developed the app because the company is “always looking” for new ways to bring AFL fans closer to the game. “It’s a handy way to keep up with your [AFL] team without having to pull out your phone all the time,” he said in a statement. A Telstra spokesperson told Techworld Australia that only the AFL Live app will be available on Pebble, but if the National Rugby League (NRL) app is added, it would "keep people" informed of the change. In September 2013, Telstra and developer Seventh Beam launched an app called AFL Glassware for the 2014 season. The Glassware app allows fans to choose a live game commentary or have the commentary translated to text via the optical display. Customers can also view scores and stats while watching the match. At the time, Good told Techworld Australia that the primary aim of the project is to ensure it has some apps available in the marketplace when Google Glass launches in Australia.